ASQ has asked their Influential Voices to respond to the question: What are some recommended strategies or tactics to help achieve successful change management? See my past blog posts as part of the ASQ Influential Voices program (I have participated since 2012). I have explored the idea of how to create a culture that promotes effective change management in several previous posts on the Curious Cat Management Improvement Blog. Change Management: Create a Culture Seeking Continual Improvement or Use Band-Aids? These tools and concepts build trust within the organization. The do that by showing people are respected and that the change effort isn’t just another in the long line of wasted effort for ineffectual change. The first part can be addressed, normally the second part can’t be addressed effectively. Often that is at the core of the issue with why the change effort isn’t working. It is a bad solutions. It hasn’t been tested on a small scale. It hasn’t been iterated numerous times to take a seed of an idea and grow it into a proven and effective change that will be successful. If it had been, many people would be clamoring for the improvement (not everyone, true, but enough people). Very few organizations take nearly enough time to train and educate employees. If you want to create a culture of continual learning and improvement you almost certainly need to focus much more on education and learning than you are. Education can be formal but also focusing on learning as you apply quality tools is extremely useful and very overlooked. Coaching is a big part of doing this well, but coaching is another thing that is massively under-appreciated. Most supervisors and managers should be spending much more time coaching than they are. 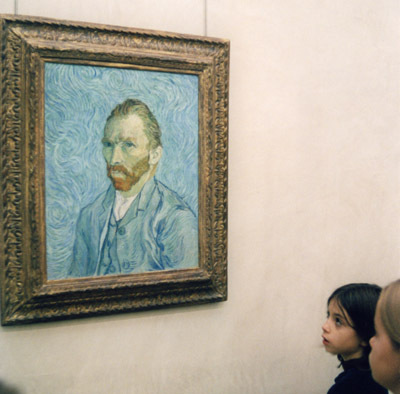 Van Gogh self portrait photo by John Hunter, Musee d’Orsay, Paris. This effort should be iterative. Create systems focused on continual improvement (which require changes that make a positive impact on results) with built in checks for frequent assessment, reflection and adjustment to the changes the organization attempts to make. Building the capacity of the organization to successfully adopt improvements will directly aid change efforts and also will build confidence that efforts to change are worthwhile and not, as with so many organizations, just busy work. People will be skeptical if they have a good reason to be so, and poor management practices found in many organizations give people plenty of reason to be skeptical that their efforts to improve will be successful. Why Do People Fail to Adopt Better Management Methods? This entry was posted in Creativity, Management, Psychology, Systems thinking and tagged ASQ Influential Voices, change, management, organization as a system, Psychology, quote, respect for people, Systems thinking on September 18, 2018 by John Hunter. When people try to use a short quote as an accurate encapsulation of a management concept they will often be disappointed. It is obvious that Dr. Deming believed that organizations failed to use data effectively to improve needed to change and use data effectively in order to thrive over the long term. He believed that greatly increasing the use of data in decision making would be useful. He also believe there were specific problems with how data was used, when it is was used. Failing to understand variation leads to misinterpreting what conclusions can appropriately be drawn from data. I believe Dr. Deming would have said something like “In God we trust, all others bring data” (I haven’t been able to find a source verifying he did say it). Others don’t believe he would referencing the Lloyd Nelson quote and all Deming’s other work showing that Dr. Deming’s opinion that data isn’t all that matters. I believe they are correct that Dr. Deming wouldn’t mean for the quote to be taken literally as a summation of everything he ever said. That doesn’t mean he wouldn’t use a funny line that emphasized an important message – we need to stop relying so much on unsubstantiated opinion and instead back up opinion with data (including experiments). Quotes can help crystallize a concept and drive home a point. They are very rarely a decent way to pass on the whole of what the author meant, this is why context is so important. But, most often quotes are shared without context and that of course, leads to misunderstandings. 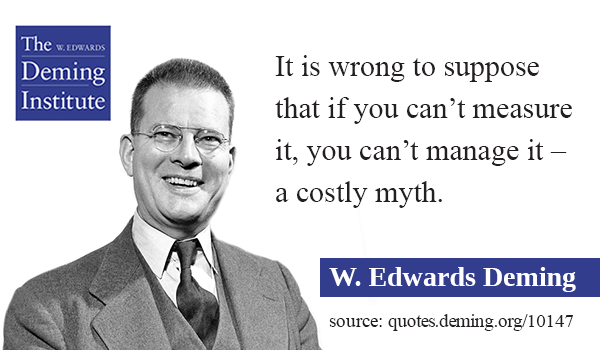 A funny example of this is the Deming quote that you often see: “if you can’t measure it, you can’t manage it.” Deming did actually say that. But without the context you get 100% the wrong understanding of what he said. Deming’s full statement is “It is wrong to suppose that if you can’t measure it, you can’t manage it – a costly myth.” Now normally much more context is required to truly understand the author’s point. But this is a funny example of how a quote can be even be accurate when passed on to you and yet completely misleading because it is taken out of context. This entry was posted in Data, Management, quote, Statistics, Systems thinking and tagged Data, Deming, quote, Statistics, Systems thinking, variation on July 25, 2017 by John Hunter. These were the most popular quotes on the Curious Cat Management and Leadership Quotes web site in 2016 (based on page views). Follow the link on the quote text for the source and more information on the quote. This entry was posted in Management and tagged quote on January 17, 2017 by John Hunter. ASQ has asked the Influential Voices on quality management to look at the question of integrating technical quality and human management systems. How do different systems—technical or human—work together? How should they work together? My view is that the management system must integrate these facets together. A common problem that companies face is that they bring in technical tools (such as control charts, PDSA improvement cycle, design of experiments, kanban, etc.) without an appreciation for the organization as a system. Part of understanding the organization as a system is understanding psychology within this context (as W. Edwards Deming discussed frequently and emphasized in his management system). To try and implement quality tools without addressing the systemic barriers (due to the management system and specifically the human component of that system) is a path to very limited success. The failure to address how the organization’s existing management system drives behaviors that are often counter to the professed aims of the organization greatly reduces the ability to use technical tools to improve. If the organization rewards those in one silo (say purchasing) based on savings they make in cutting the cost of supplies it will be very difficult for the organization to optimize the system as a whole. If the purchasing department gets bonuses and promotions by cutting costs that is where they will focus and the total costs to the organization are not going to be their focus. Attempts to create ever more complex extrinsic incentives to make sure the incentives don’t leave to sub-optimization are rarely effective. They can avoid the most obvious sub-optimization but rarely lead to anything close to actually optimizing the overall system. It is critical to create an integrated system that focuses on letting people use their brains to continually improve the organization. This process doesn’t lend itself to easy recipes for success. It requires thoughtful application of good management improvement ideas based on the current capabilities of the organization and the short, medium and long term priorities the organization is willing to commit to. providing everyone the tools (often, this means mental tools as much as physical tools or even quality tools such as a control chart). By mental tools, I mean the ability to use the quality tools and concepts. This often requires training and coaching in addition to a management system that allows it. Each of these is often a problem that is not adequately addressed in most organizations. an understanding of what data is and is not telling us. An integrated management system with an appreciation for the importance of people centered management is the only way to get the true benefit of the technical tools available. 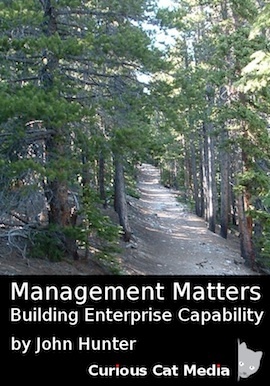 I have discussed the various offshoots of the ideas discussed here and delved into more details in many previous posts and in my book – Management Matters: Building Enterprise Capability. An article, by my father, also addresses this area very well, while explaining how to capture and improve using two resources, largely untapped in American organizations, are potential information and employee creativity. It is only by engaging the minds of everyone that the tools of “technical” quality will result in even a decent fraction of the benefit they potentially can provide if used well. This entry was posted in Management, Psychology, Systems thinking and tagged ASQ Influential Voices, curiouscat, evidence based management, management concepts, management system, management tools, organization as a system, Psychology, quote on July 6, 2016 by John Hunter. These were the most popular quotes on the Curious Cat Management and Leadership Quotes web site in 2015 (based on page views). Follow the link on the quote text for the source and more information on the quote. This entry was posted in Management and tagged Books, Data, leadership, quote on January 12, 2016 by John Hunter. Robert Frost was poking fun at his friend who would obsess over what fork to take in the path as they walked when in reality the choice made no difference. And “that has made all the difference” is poking fun at self justifications of our actions; congratulating ourselves for doing something not really worthy of accolades. Still the top three lines do seem like insightful advice. Of course what is really needed is insight into when choosing the road less traveled is wise (or at least a sensible gamble) and when it is less traveled for very good reasons. I do believe we far too easily slip into habits encouraged by the well worn path most people take. And therefore think balancing that tendency with at least considering the road less traveled more often is wise. But I actually like that when you read the full poem it really isn’t saying that. This entry was posted in Creativity, Psychology and tagged coaching, Creativity, Psychology, quote, theory of knowledge, thinking, travel on September 2, 2015 by John Hunter. Jimena Calfa interviewed me for her blog OnQuality as part of her Quality Interview Chain. What are you doing to ensure you continue to grow and improve as a professional and/or as a person? John: I don’t do anything consciously to achieve that. I think if we retain a thirst for knowledge and curiosity and have a desire to do a good job we will do what is necessary. I follow my passion to learn largely through the internet (blogs, webcasts, articles and podcasts). And I constantly question and experiment and adapt based on what I learn. Which is your favorite quality quote? Read the whole interview on OnQuality. 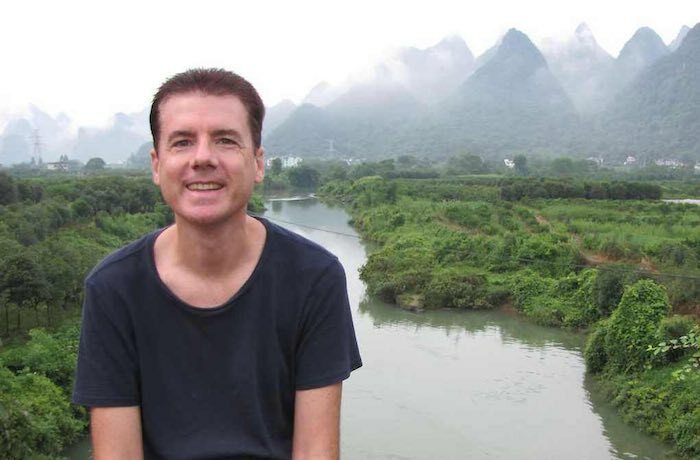 This entry was posted in Career, Management and tagged Career, interview, John Hunter, quote on June 16, 2015 by John Hunter. My response to: Where is the Deming study that asserts most errors are in organization or process? 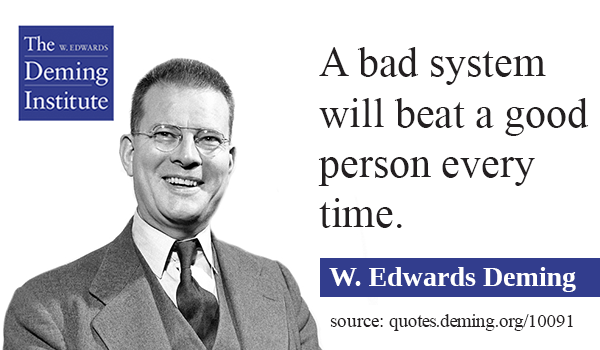 There is no such study, it is based on Dr. Deming’s experience as I discuss in 94% Belongs to the System (improve the system, don’t blame the people in the system). Getting hung up on the figure 94% is a mistake. His point was that you improve performance going forward by improving the system not blaming people. His two books provide background and the thought process involved behind why we are failing to manage better. Changing the people, while leaving the system in place, most often doesn’t help. Variation does confuse people sometimes. The same mistake as say yelling at someone any time results are really bad. Most likely results will get better. Not because yelling helps but essentially regression to the mean. So you can move people out after really bad results and things get better. Of course, most of the time they would have gotten better if you left the people there (and did nothing or yelled). Even when the person did totally mess up, why did the system allow that? Why did the system put that person in a place where they were not qualified? Answering and fixing these types of questions would help improve the system and the results going forward. Yes, occasionally the answer might be that Joel was hired sensibly, managed and coached sensibly but he just became a complete jerk and won’t respond to coaching and this is only his fault. But normally that won’t be the case, even when the person seems nearly totally to blame (and that isn’t even a very common situation) normally there are obvious weaknesses in the system that put them in the place to fail and will likely put anyone else in the same place in the future. 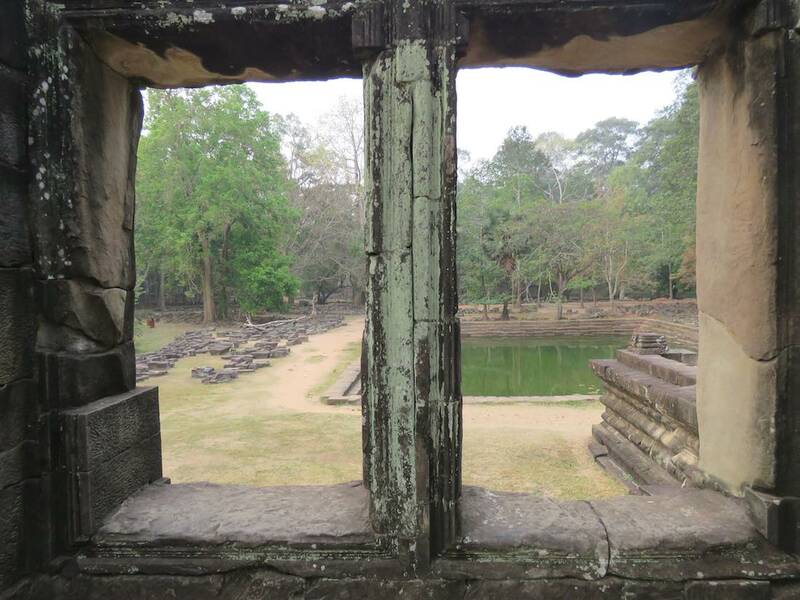 This entry was posted in Deming, Management, Process improvement, Systems thinking and tagged coaching, continual improvement, Deming, gemba, process thinking, quote, respect for people, Systems thinking on February 6, 2014 by John Hunter. The best examples of Lean in healthcare are examples where leaders and organizations learned, but did not blindly copy. Sami Bahri DDS (the “lean dentist”) read Deming, Shingo, Ohno, etc. and had to figure this out himself, rather than copying some other dentist. We can learn from others, run our own experiments to see what works, and keep improving to make it better than even Ohno or Shingo would have imagined. This entry was posted in Creativity, Deming, Lean thinking, Quality tools and tagged continual improvement, guest post, lean manufacturing, quote, Taiichi Ohno on August 21, 2013 by John Hunter. Our brains are good at creating theories, from our experiences, so that our brain can learn. However when this is done only subconsciously we can be led astray. And in complex situations where it is not easy to see the causal relationships (managing human systems for example) it easier for us to be led astray when we are not consciously thinking about the theory driving our thoughts and decisions. When we are learning (as little kids) we don’t understand that are brain is creating theories to help us learn. But our brain is creating theories and testing them out. What happens when we push the spoon off our high chair? Lets try it 500 times and see. After repeated experiments, we learn a good deal about how gravity will affect objects no matter where you are, no matter if you are in a highchair, or a stroller or a slide or your mother’s lap… We also learn about how people will react (psychology). Worm charming is a behavior birds use to encourage worms to go to the surface so the birds can then eat them. The methods used vary, however tapping earth with feet to generate vibrations is widespread. One theory for why the worms go to the surface is the vibrations are similar to those produced by digging moles, which prey on earthworms. This bird doesn’t understand the theory behind their instinct. Therefore the bird can’t understand that a worm is not likely to burst through the pavement. Too often managers are applying behaviors without understanding the theory (or without evidence showing that the practice based on the theory is effective – failing to practice evidence based management). And so the managers don’t understand that the behavior will not be successful given the conditions they find themselves in. This entry was posted in Deming, Psychology, quote and tagged curiouscat, Deming, learning, Psychology, quote, theory of knowledge on June 11, 2013 by John Hunter.